Air Tech Air Conditioning & Heating specializes in residential and light commercial heating, air conditioning and indoor air quality service in Royal Oak and throughout Southeast Michigan. No matter what the season, your indoor air quality is important to your health, comfort, and home furnishings. 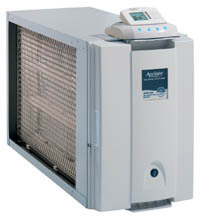 AirTech provides indoor air quality systems that are designed to provide you the best air quality possible. Whether you are replacing your existing heating and cooling system, or are having a routine furnace cleaning, there's never a bad time to invest in your indoor air quality. Air Tech provides Aprilaire indoor air quality systems and is fully qualified to determine what you may need in YOUR home. Don't suffer through an uncomfortable Royal Oak winter again - contact us today for all your indoor air quality needs! There are many potential pollutants and toxins that can enter your home and you need to be able to protect your family from the many health risks associated with these contaminants. Air Tech shares this concern, which is why we offer only the best indoor air quality products available. Whether your home has woodwork that is showing damage because of too dry or too humid conditions, has temperatures that vary from one room to another, or is plagued by musty smells and odors -- Aprilaire has a family of products that are designed to provide you with the best indoor air possible. Indoor air quality needs can differ by the region you live in, the type and age of your home and more. For example, newer homes tend to be more tightly constructed leading to higher energy efficiencies. However, because of this, odors and indoor pollutants tend to build up inside your home. Mechanical ventilation along with a whole-home air cleaning system can help alleviate the problems associated with newer, tighter home building methods and construction. When is the best time to improve my indoor air? Anytime! Whether you are investing in a unit to add on to your existing heating and air conditioning system, are renovating or building a home, replacing your existing heating and cooling system, or are having a routine furnace cleaning -- there is no bad time to install an indoor air quality product. However, installation time and cost can be factors for some products such as an Aprilaire Zoned Comfort Control system which is easiest to install when a home is being built or remodeled. If you're ready to tackle your indoor air quality problem, Air Tech Air Conditioning & Heating has you covered. Contact us today for all your indoor air quality needs!